Its always a good day when a photography book is delivered at home. Today, three were delivered, making it a very good day. Triplekite Publishing have been hard at work producing the first three in what is planned to be an ongoing series of books under the ‘Discovery’ series. The stated aim of this series from Triplekite is to produce a ‘cohesive representation of landscape photography’. The plan is to release three books a year, identical in size (240 x 240mm) and page count (48), each with 25 plates which, despite being smaller than Triplekite’s other photography books, will still be made to the same exacting production standards. The plan is to release a further three or four books in the series in 2016. 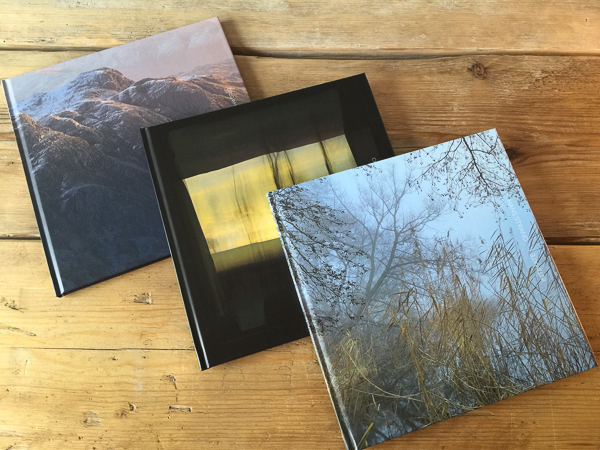 This initial launch series of three books demonstrates the range of photographers and styles of photography we might see in future publications. We have a landscape ‘mega-star’, Hans Strand, with his book, ‘Intimate I’. Contrasting diametrically with this in image style we have Chris Friel and his collection, ‘Framed’. Finally, we have an emerging talent, Greg Whitton, and his classic mountain landscapes in ‘Mountainscape’. This willingness to showcase a breadth of photography styles and photographers is refreshing. Too many major publishers cling to commercially safer projects founded on the big names in photography making images in classic styles. The small, independent publishing houses like Triplekite are breathing life into photography by bringing to our attention up and coming photographers with alternative styles of work for us to consider and be inspired by. If we see the value in this it is vital we enable this to continue by supporting these publishers and photographers by buying their books. I immediately like the concept of a collectable series of books, sized so that they will sit together on the bookshelf. It appeals to the collector in me, as well as satisfying my inner need for tidiness. A while back, Triplekite release a softcover publication entitled ‘Land|Sea’, which was designed to showcase the work of emerging photographers. The concept was good, the production values very high and as a result I suspect the price point was a little too high for the format. Perhaps, also, mixing several photography styles in one volume didn’t sit well with everyone. Some like to choose whose work they collect while others like to own every volume in a series. I have a feeling that approaching the challenge in the way this ‘Discovery’ series does will be far more successful. The production values are very good indeed – the paper used is beautiful, bringing out the rich depth of colour in the images. Triplekite have established a strong relationship and rapport with their printer in Malta and continue to take the trouble (and invest the time and money) to go out to sign off the initial prints. The hard back binding is of excellent quality and I am a fan of printing on the hard cover rather than having a dust jacket. Hans has published three previous books on landscape photography, one of these which has been hugely successful with Triplekite called ‘Iceland | Above & Beyond’. This new book, the first of a series of three, reveals a different side to his work, shifting the focus from the grand vistas and wider landscape to more intimate details. In this volume you can feast on images made by a master at work. Hans talks in his introduction about how important the corners of the image are to him and how, by concentrating on getting the composition to sit well in the corners the rest of the composition often falls into place. Sitting down and really studying these images can teach us a lot in how to improve our own compositions, especially of these more intimate studies where there is no horizon line and no sky. Hans here, using images from the early 1990’s to the present, shows a mastery, not only over light and composition but also over colour, shape and form – all bought together in his images to produce quiet beauty, a tranquility and calmness that makes this a soothing book to study. I will pick ‘Intimate I’ up regularly to drink in these images and hope one day to be able to take something approaching this good. Greg is an emerging photographer, winner of Outdoor Photography magazines the ’Outdoor Photographer of the Year’ title in 2014. His speciality is the high mountains of the UK and he has recently moved to the Midlands to be based centrally in order to reach them more easily. His approach is not just to visit mountainous areas and photograph them. After all, countless outdoor photographers do that. No, it soon becomes clear when you open ‘Mountainscapes’ that Greg is one of the rare breeds of photographers who is prepared to suffer for his art. He clearly carries his gear high into remote areas, high into the mountains in order to capture views seldom seen. There are relatively few who are prepared to do this to the extent Greg does this, but the rewards can be great as you will see from his images. Greg must climb in foul weather, many images show it receding (or approaching). He climbs in the cold, most of the images have snow on the hills. Yet, it is clear why he does this as the light and drama this gives to already dramatic scenes is extraordinary. He is clearly privileged to see wonderful moments that most of us mere mortals can only enjoy because he is prepared to endure the deprivations he does. It is so refreshing to see mountains photographed from high up. I have to confess, almost all of my mountain images are shot from low down (unless, of course, a road happens to go up one). From the heights we get a real sense of the majesty of Snowdonia, Cumbria and Scotland. For me, the motivation to be out with my camera in changeable weather increased on seeing Gregs work. Surely the images that might be yielded are worth the soaking and the freezing? Just for that glimpse of breathtaking light? This is a book to settle down with on a winters evening in front of the fire, pour a favourite tipple, and think of Greg, because in all likelihood he will be up a mountain somewhere waiting for tomorrows light. Before I start, I have to declare an interest in this book by Chris Friel. Firstly, in addition to being able to call Chris a good friend, I was privileged to have been asked by Chris to write the foreword for this book. So I have been involved in its production. However, I will try and give you an impartial feel for what to expect from the book. ‘Framed’ is a great example of what the ‘Discovery’ series is designed for, namely, to promote thought provoking projects and work from photographers and artists. Chris has been described as ‘one of the finest contemporary landscape photographers in the UK today’. His work bridges the gap between photography and art, with a distinctly abstract and painterly feel. This volume showcases a recent project Chris has been pursuing based on a collection of his Intentional Camera Movement Images (ICM) where he moves the camera during the exposure to give a painterly, dreamlike effect to the image. This he has presented with a deep, again, almost painted, frame. I have loved his work since I first saw it years ago and these images make a fascinating introduction to an alternative approach to landscape photography, in contrast to the other two books in the series. Here you will find a much greater opportunity to find your own story in the images. The lack of sharpness and depth of field, the obscurity and the glimpse of a world beyond the frame all allow us to dream of a world beyond – to use our imaginations, which so much of landscape photography today doesn’t let us do. For me, this is an important book, and the first of many from Chris, I hope, that will show us the world as he sees it. All of these books are available from the Triplekite website. You can purchase them in three editions. Firstly as a standard edition for £18.50, secondly as a special edition (limited to 50 – book signed, numbered) for £45 which includes a signed A3 limited edition print (#80) or the luxury edition (limited to 30 – book signed, numbered) which includes two signed A3 prints (one #80 and one #30). Just click this link to go to the Triplekite website for more information and to buy books. In the interests of full disclosure. I am not paid to write these reviews. I receive a press copy from Triplekite but they do not see my review in advance of publication not do they have any control over what I write. The above link to their website is NOT an affiliate link. I get no commission for sales made on any books sold through the link. In all my reviews of books, gear or companies I always try to be open and honest in everything I say. I will not recommend and publication or product I do not believe in myself. Thank you so much for showing us these books. The glimpses of the images made me want to put in an order immediately!